The 2019 $0 down, VA home loan limit for Lewis County is $484,350. Named after the famous explorer, Meriwether Lewis, Lewis County is located near the eastern side of Idaho. The Idaho State Legislature officially created the county in 1911 from a portion of Nez Perce County. Encompassing a total area of 480 square miles, Lewis County is the fourth-smallest county in Idaho. The Clearwater River and Columbia Basin are both located in Lewis County, which makes it an excellent location for water sports and more. Outdoor activities are popular in Lewis County, thanks to the Clearwater National Forest. With a population of 3,838, including a veteran population of 468, Lewis County is the fourth-least populated county in Idaho. Clearwater National Forest is a nationally protected forest located in Lewis County. The Clearwater National Forest is home to lush forests, clear streams, and flower-filled fields, great for exploring. Camping is popular in the Clearwater National Forest thanks to the abundance of RV and tent campsites. There are hot springs located in the forest, which are a great place to relax after a long week. The many rivers in Clearwater National Forest make it an excellent location for fishing, boating, and more. A great event for the whole family held in Lewis County is the Lewis County Fair. The fair features delicious food vendors, fun games, and exciting entertainment. The Lewis County Fair also hosts many 4-H events with prizes. An annual Combine Demolition Derby, Grain Truck racing, and many carnival rides are held at the Lewis County Fair. Over 3000 people attend the fair each year. For some of the best food in Idaho, be sure to visit one of the local restaurants in Lewis County. For everything from authentic Mexican food to your favorite fast food joints, they have it all in Lewis County. Dining on the Edge is a restaurant in which you can enjoy exquisite dishes while overlooking the Clearwater River. The towns and cities in Lewis County are full of many shopping options, including grocery stores, specialty stores, flower shops, and much more. The Syringa Hospital VA Clinic and several other veteran resources are located in proximity to Lewis County. Specialty license plates, employment benefits, and tax benefits are just a few of the great benefits offered to veterans living in Idaho. The median housing cost in Lewis County is $116,600, and the median household income is $36,000. 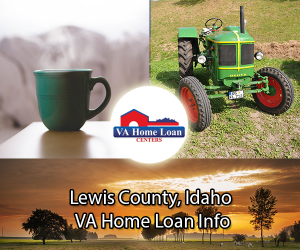 Call VA Home Loan Centers at 888-573-4496 for help finding and financing a home in Lewis County. 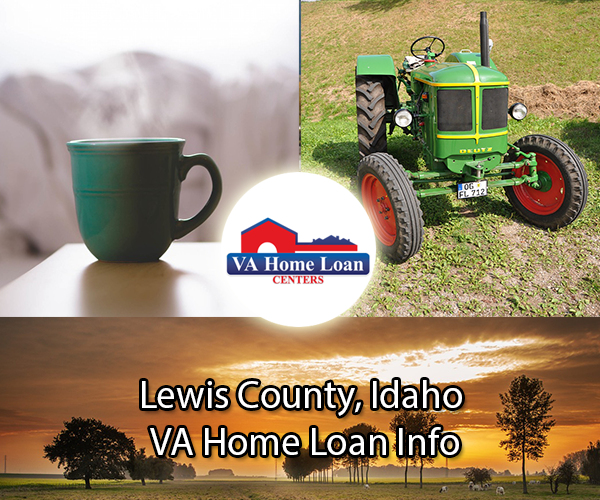 For an updated list of VA-approved properties in Lewis County, contact VA Home Loan Centers. There are not currently any VA-approved condos located in Lewis County. Click here to find out how to get your condo approved!